Breakdown: The Bank of America Shamrock Shuffle is often called out as being the start of Chicago’s running season due both to its size and its placement in the calendar. Some years Chicago’s fickle weather patterns can make this claim seem a bit dubious despite the large crowds of runners and running teams participating, but Sunday morning as the sun rose and temperatures rose with it (all the way to the mid-fifties! ), it was evident that racing season in Chicago had officially begun. As race announcers made sure to inform runners before, during and after the race, the Shamrock Shuffle is the largest 8K in the world (in fact, it’s one of the largest racing events in the world) and corralling more than 30,000 runners is never an easy task. But organizers seem to have gotten this massive race coordination down to a science and all the moving parts fell into place perfectly throughout the event. The further division of the racing field into three waves (up from two last year) allowed for a bit more space on the course and a more steady stream of runners throughout the morning. The course gives runners a taste of the Chicago Marathon experience, following part of the course and letting them experience the joys (and pains) of jostling for position in such a crowded field. The post-race party around the Buckingham Fountain featured a live band, a free beer for each runner over twenty-one and plenty of sunshine. 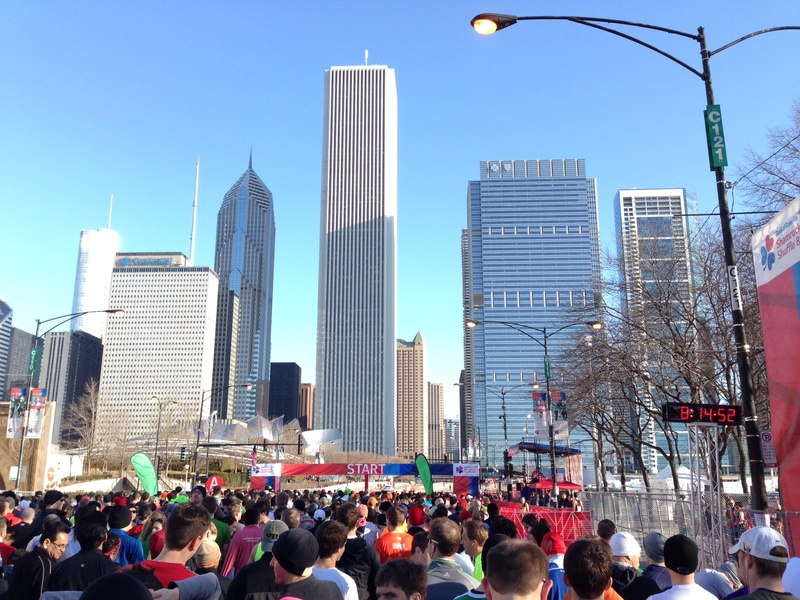 Course: Runs through downtown Chicago, starting and finishing in Grant Park. Plenty of well-stocked water stations stocked with liquids and excited volunteers. Organization (gear check, etc. ): Despite the hassle of getting to the end of Navy Pier for the expo and packet pickup while Navy Pier is undergoing a huge renovation, the entire event has been streamlined after 35 years. Goodie Bag (includes shirt): The virtual goodie bag and real-life goodie bag are equally stuffed with ads and offers. The shirt this year is white and a bit more heavily influenced by the Bank of America color scheme than anything related to shamrocks but it’s a fashionably simple design. A free beer at the post-race party is included on the race bib.